We hope you will make use of this list as a way to both remember these genocides, and learn more about them. This is our second entry, the Rwandan Genocide. Melvern gives a shocking portrait of calculated mass murder, revealing how the international community, and especially the U.S., failed to act in the face of a carefully executed plan to murder one million Tutsis and moderate Hutus in Rwanda in 1994. The book explores the inner life of the man who became one of the most prominent public faces of the Rwandan genocide. Rusesabagina tells the story of his life which led him to become the first Rwandan manager of the Hotel Milles Collines and brings the reader inside the hotel for the days depicted in the film, “Hotel Rwanda”. In this memoir, Joseph Sebarenzi presents a thoughtful critique of Kagame’s regime. His tale is a provocative warning to the many outsiders who are ready to canonize Paul Kagame, the ruler of Rwanda since the genocide. This searing firsthand account of Rwandan native Ilibagiza’s experience in 1994 cuts two ways: her description of the evil that was perpetrated, including the brutal murders of her family members, is soul-numbingly devastating, yet the story of her unquenchable faith and connection to God throughout the ordeal uplifts and inspires. In this French-English translated book, the author made several trips to the Bugasera-one of the region’s most devastated by the genocide. In the villages of Nyamata and N’tamara, he interviewed 14 survivors. From child farmers to school teachers, each person gives accounts of their experiences. This book features the testimony of 10 friends from the same village who spent day after day together, fulfilling orders to kill any Tutsi within their territory during the 1994 Rwandan genocide. Hatzfeld offers an analysis of the psychology of the perpetrators and how the Rwandan genocide differs from other genocides in history. As former head of the late 1993 U.N. peacekeeping mission in Rwanda, Canadian general Dallaire’s initial proposal called for 5,000 soldiers to permit orderly elections and the return of the refugees. Nothing like this number was supplied, and the result was an outright attempt at genocide against the Tutsis that nearly succeeded, with 800,000 dead over three months. The book documents in horrifying detail what happens when no serious effort is made. The stories in this book are unrelentingly horrifying and filled with “the idiocy, the waste, the sheer wrongness” of one group of Rwandans (Hutus) methodically exterminating another (Tutsis). With 800,000 people killed in 100 days, Gourevitch found many numbed Rwandans who had lost whole families to the machete. Why are opposition leaders under 24 hour survelience in Rwanda? Here is a report from Al Jazeera on Rwanda’s ‘opposition crackdown’ ahead of presidential poll. 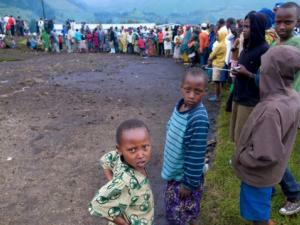 Rwandans are preparing to vote for their country’s presidential election as campaigning comes to an end. Paul Kagame, the incumbent president and candidate for the ruling party, has gained massive popularity from both ethnic Tutsis and Hutus who recognise his leading role in boosting the country’s economy. But more and more people are questioning his record on democracy amidst claims of a violent crackdown on opposition supporters in the run up to the election. Al Jazeera’s Andrew Simmons reports from the capital Kigali.